It got very cold on the upper deck in late May and all four of us relocated to the main deck of the glass-bottom ship. The water was so clear that we could see it as if they were lying in the open. It was not only us on the ship looking back in history, there were some sea kayakers too who had pedaled to the site and were observing them. 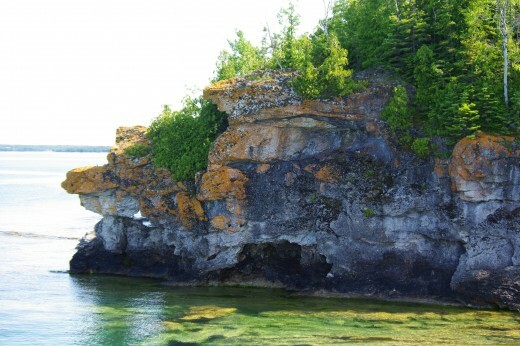 the ancient cliffs of Flowerpot Island. 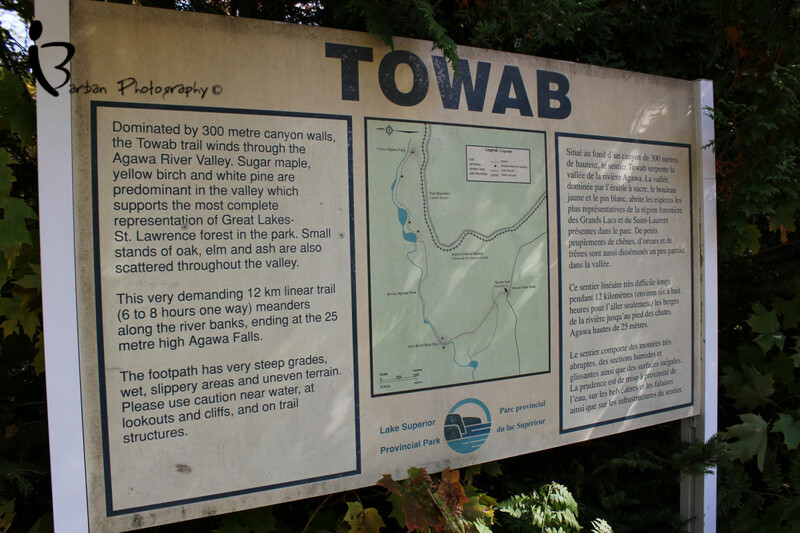 The park is a part of much larger ecosystem with Niagara Escarpment (a World Biosphere Reserve) as a backbone. Our hikes with K2 the Kuvasz boy in other conservation parks in Niagara Escarpment will become part of future hubs. 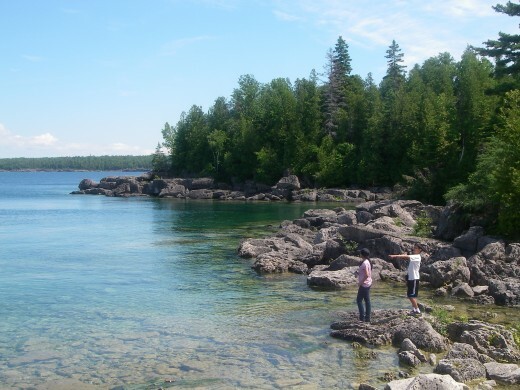 Like the neighbouring Bruce Peninsula National Park, Fathom Five National Marine Park is located in close proximity to somewhat densely populated southern Ontario. It is, therefore, popular with the tourists who are attracted to its water and land based activities, including scuba diving, boating, and hiking. 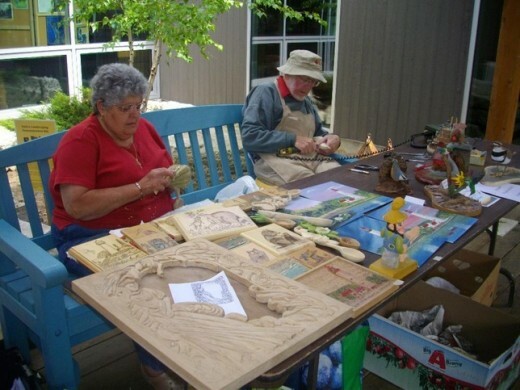 We started from the Visiting Centre, which caters both for the Bruce Peninsula National Park and Fathom Five National Marine Park. 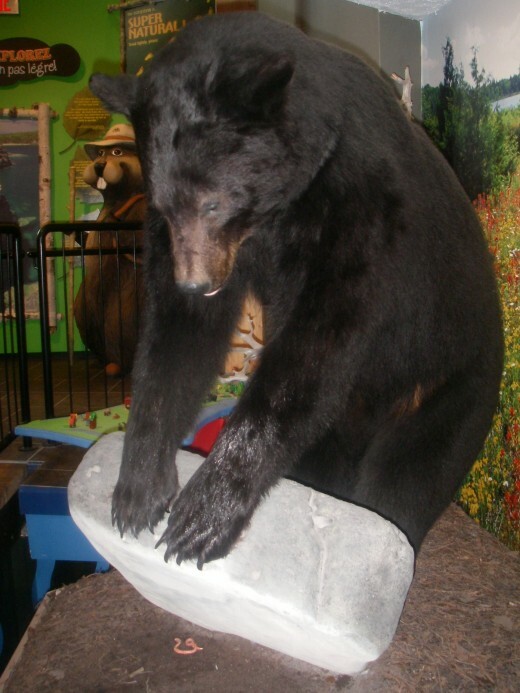 Here, we watched an introductory facts laden high-definition movie on the two parks, visited an exhibit gallery showcasing everything from a full-size lighthouse to geological features to wildlife to shipwrecks to archaeological relics, and shopped for the souvenirs in the gift shop. We also climbed a 20m (65’) tall tower on its premises for a bird’s-eye view of the park. 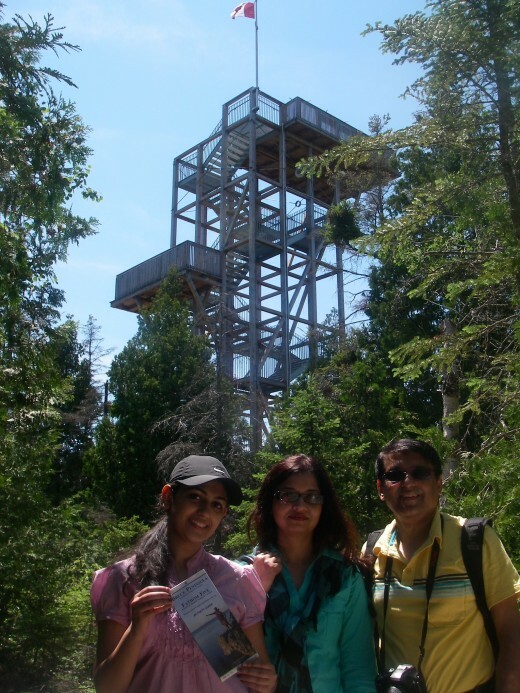 The tower is located at a distance of about 800 meters behind the parking lot. It is visible from all over. The 3.5 km track that starts and finishes at the Visitor Centre, took us through a dense forest. It was so humid in late June that we were sweating profusely. 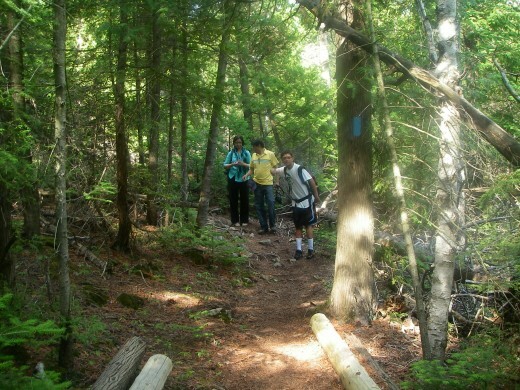 However, the trail opened up on the Georgian Bay at Dunks Point and offered us a respite. Trying to reach the lakeshore over the cobble stones drained us of the remaining energy to the point that we decided to call it a day and took a late lunch. In our excitement to see the beautiful waters and the nearby attractions, we forgot to even avail the facility of glass-bottom. 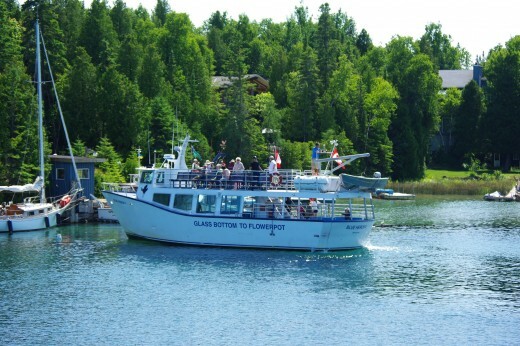 We took Great Blue Heron cruise from Tobermory. This is reportedly Canada's largest glass bottom boat and can carry up to 125 passengers. Great Blue Heron departs from Little Tub Harbor, located near the downtown Tobermory,at regular intervals. 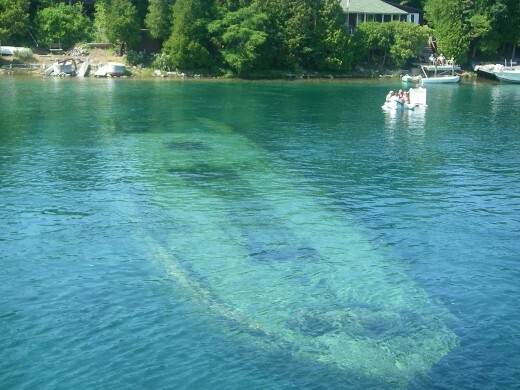 Our two hour cruise began with a visit to two nineteenth century shipwrecks located in Tobermory's Big Tub Harbor. The water was so clear that we could see the shipwrecks clearly. Scuba divers were preparing to dive to observe the shipwreck even more closely. The cruise ship then sailed through the south and west sides of Russel Island. 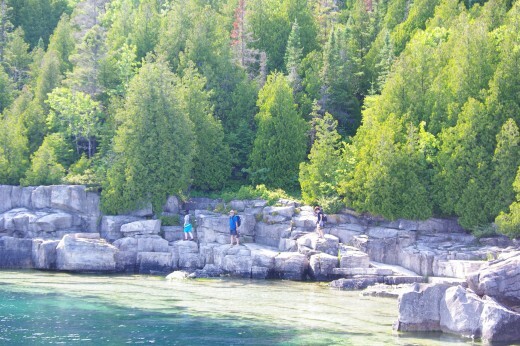 We noticed shoals typical of the Lake Huron side of the Bruce Peninsula. We had lodged ourselves on the front side of the top deck only to be tantalized by cold wind even on a seemingly hot day. Russel Island is approachable by sea kayaks. 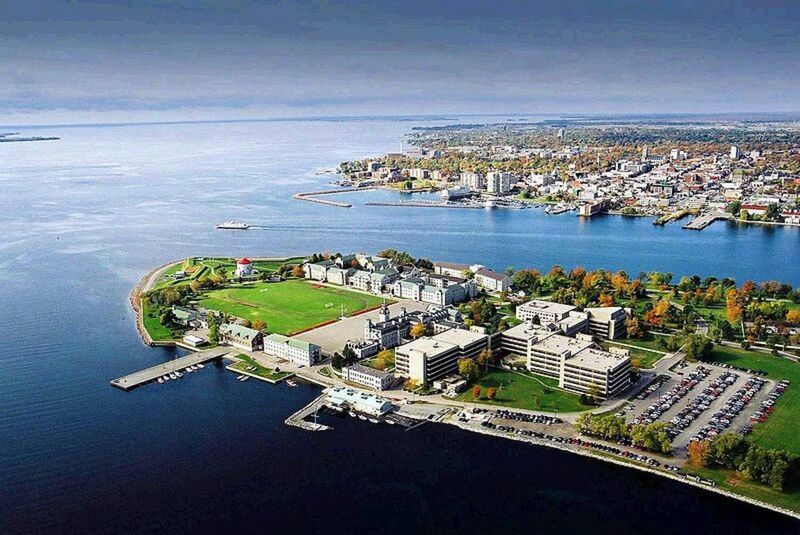 The ship then sailed northward, cutting across the Devil Island Channel and to a small Island called White Rock. 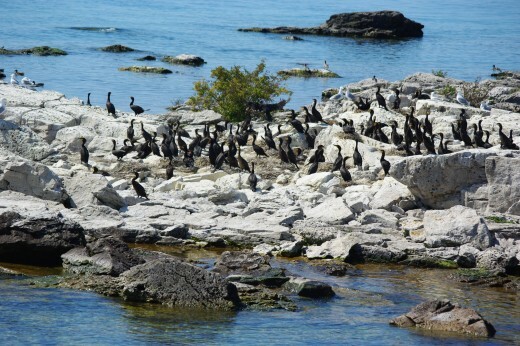 This island was a nesting site for the Double Crested Cormorants. We took lots of pictures of the birds resting on the island taking the sunshine in. This reminded us of another sailing expedition and that was on Lake Osceola, Orlando, where the guide had educated us on the difference between Cormorant and Anhinga. The cruise then headed into seemingly the prettiest part of the trip, the southwest corner of Cove Island. The water was so clear that we could see fish at the bottom of the lake. By then, passengers had relocated on the main deck of the ship, because it was very cold on the upper deck. Due to the calmness of waters in the island bay, we saw many boaters enjoying fishing, scuba diving, snorkeling, jet skiing, canoeing, kayaking, pedal boating, and other types of water sports around Cove Island. The greenery and beauty of the overall surroundings was certainly matchless. 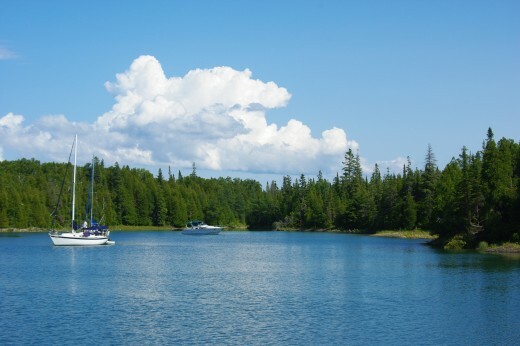 We continued along the south shore of Cove, through the Otter Island Channel and east to Flowerpot Island. 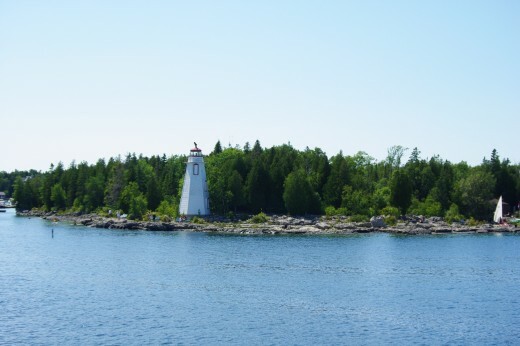 This 200 hectares island gets its name from two unusual rock formations on its eastern shore. 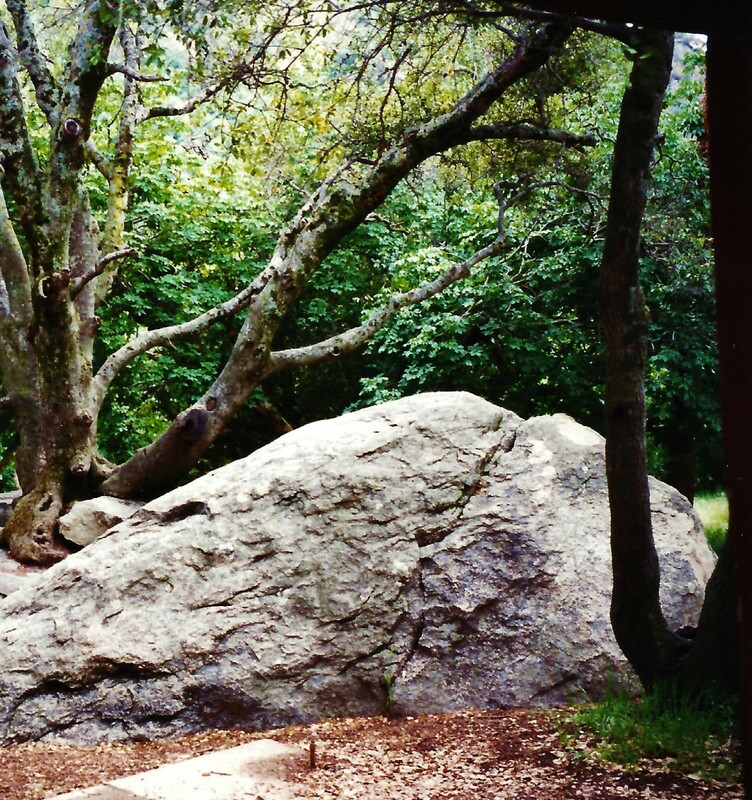 This is the only Island where camping and hiking is permitted. We cruised right by the Flowerpot rock formations where we took lots of pictures. 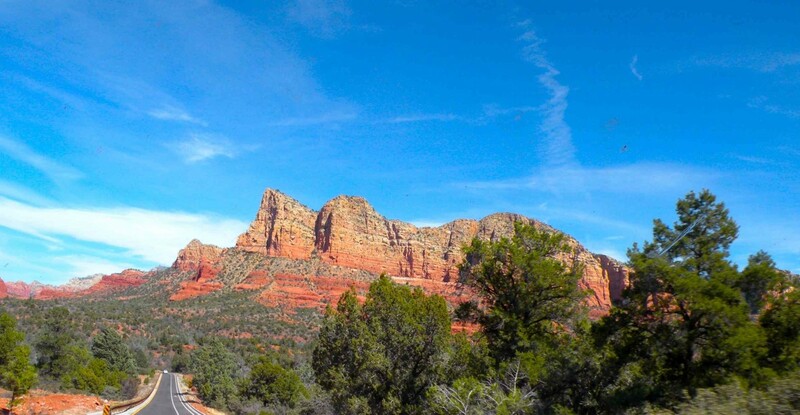 There were many tourists either hiking over the rocks or sitting by the Flowerpots rock formations. Although we were not in a position to do any hiking on the island, for those interested in taking another ship there, the dock is located at Beachy Cove and it is a 15 minute hike up to the Flowerpots. We were able to see many resident waterfowls in the late June trip,although one should plan a visit for May or early October to see the maximum number of bird species migrating through the islands during their spring and winter migrations. Cormorants made a pleasant site everywhere. Bald Eagles, bears, dears and rattlesnakes call Cove Island home because it is a large island and is closest to the mainland. 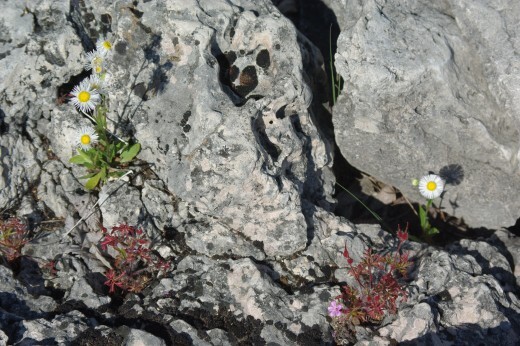 These species are not found on Flowerpot Island, because it is farthest from the mainland and these species have not made it to that island. Garter snakes and red squirrels are present on that island though. The park supports unique geological features of Alvars and eroded rocks in strangest of shapes. Alvars are naturally open habitats with either a thin covering of soil or no soil over a base of limestone or dolostone. This feature is found only in the eastern European Baltic region and the North American Great Lakes Basin. Almost 75 percent of North American alvars are located in Ontario. 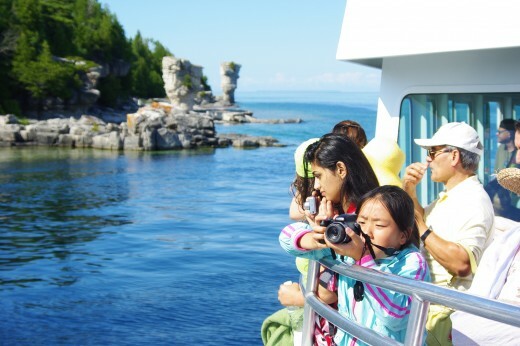 Fathom Five National Marine Park and the neighbouring Bruce Peninsula National Park are great places to observe these features. We had to be careful during hiking always keeping an eye on a fissure or a crevasse on the hills and sprawling roots of nearby trees on the trail. We were amazed at the strange twisted and U shaped cedars trying to support themselves on bare rocks facing severest of elements like wave impact and weight of heavy frozen snow during winters. We later found out the fact that many of the cliff hanging white cedars are over 500 years old was not known until 1980s. The Park can be reached by taking north exit of Hurontario Street (Highway 10) from Highway 401. Continue until Highway 10 north joins Highway 6 north (coming from Guelph) at Owen Sound. 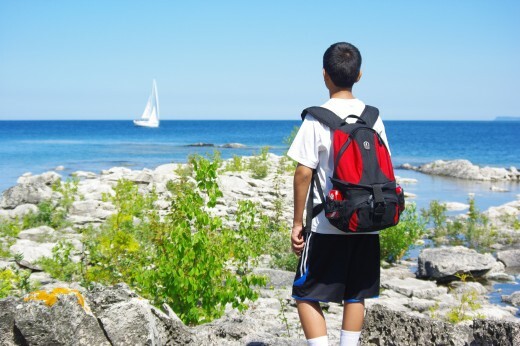 Follow Highway 6 north past Owen Sound and Wiarton (a town at the base of Bruce Peninsula) all the way to the picturesque Tobermory, which is the last town on Bruce Peninsula with a population of 4,200. For those interested in an affordable and comfortable extended stay, Tobermory and Highway 6 on its last 5 km stretch offer reasonable accommodations. However, advanced booking is highly recommended due to the popularity of the peninsula with the tourists. 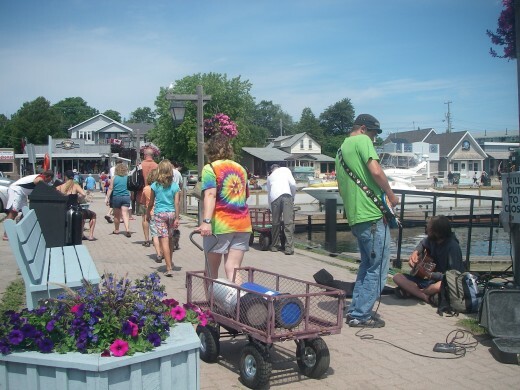 Tobermory itself is has many stores, outdoor fitters and restaurants catering to the tourists. 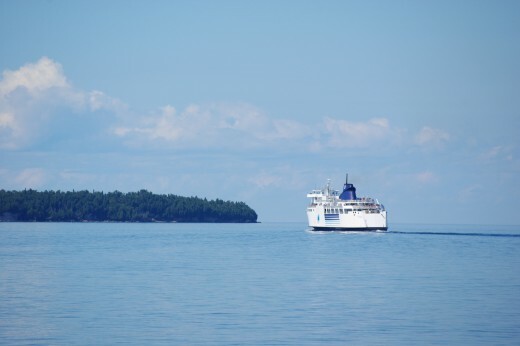 Tobermory is also the home of the Chi-Cheemaun Ferry, the southern terminus to very touristic Manitoulin Island. 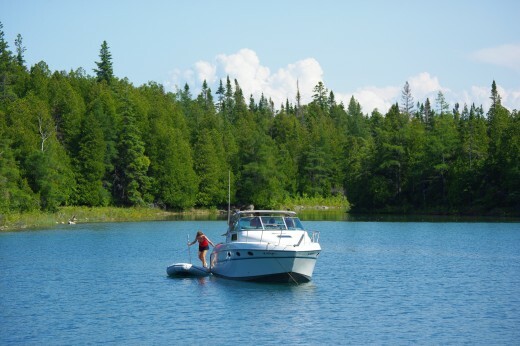 Reservations are definitely recommended for the 7:00 am sailing in July and August. And of course, you can take your car on board. Reflecting on the day of the cruise, we wished we were into scuba diving too. That would have enabled us to dive down and check the shipwrecks out buried deep in the crystal clear waters of the Georgian Bay. Constrained by our lack of training, we let our imaginations run wild. But some of our fellow visitors were fortunate for they really enjoyed every bit of scuba diving, bestowing such title on the park as "scuba diving capital of the world'. Have you heard about this national marine conservation area before? Thank you Marie, for visiting this travel related article from me. It was a surprise for all the visitors to see shipwrecks like those. Looks like a beautiful place to visit. 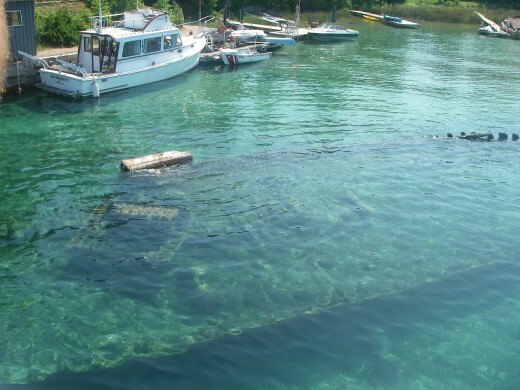 You can really see the shipwreck through that clear water. Great picture. You have picked a beautiful place to write about. To be able to see through clear water must be a treat in this day and age.Up votes and sharing. Thank you very much for the kind words. I enjoy hiking with my dog and photography. I am just covering these two aspects in my articles. Wow another great hub by you ;you are so talented and I am pleased to have come across you on here. here's to so many more hubs by you and wishing you a wonderful day. Thank you epigramman for leaving best ever comment on my hubs. It is truly an honour for me to have received such an impressive attention and then a very encouraging comment from you. I have travelled to many countries and to many US states, but I really love Ontario. Tourists tend to underestimate its beauty in terms of nature, culture, history and even archaeological treasures. So when people ask me if I have been to California, Egypt or Norway, I tell them frankly that right now I am discovering my own province lol. I thank you for including me on your FB. I will follow you and many of your hubs seem to be to my taste. I will shortly be exploring them. Say hello to T and G from K2 and me. Good morning Mr. Kent of Canadian Clark from your fellow Canadian Colin and his two cats Little Miss Tiffy and Mister Gabriel at lake erie time ontario canada 3:40am. What a lovely tour guide you are and a world class one at that. I've looked over and read a few of your hub presentations and each one is like a true labor of love. I will madly and gladly post and link your hub bio and introduction page on my FB wall in order to get you some more readers and followers. I for one will send you some fan mail right now. Yes I also talk walks of solitude and often writer's walks too around the bay of my lake and also walk with my deaf cat Gabriel on a leash. So nice to meet you my friend and you make me proud to live in Ontario where there is so much to see and do. Thank you Mary. Your comments made my day. Btw, for some odd reason, I like NY side of Niagara Falls much better than Ontario side. The experience with the falls from NY side is much more at a personal level. From Ontario, it is from a greater distance. 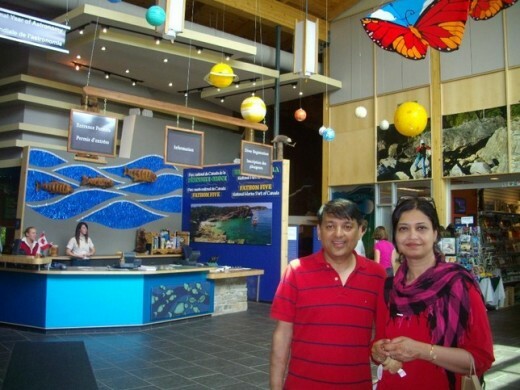 Oh Suhail this is a very impressive travel hub! You've written it so that it is very interesting from start to finish and you've packed it full to the brim with information. 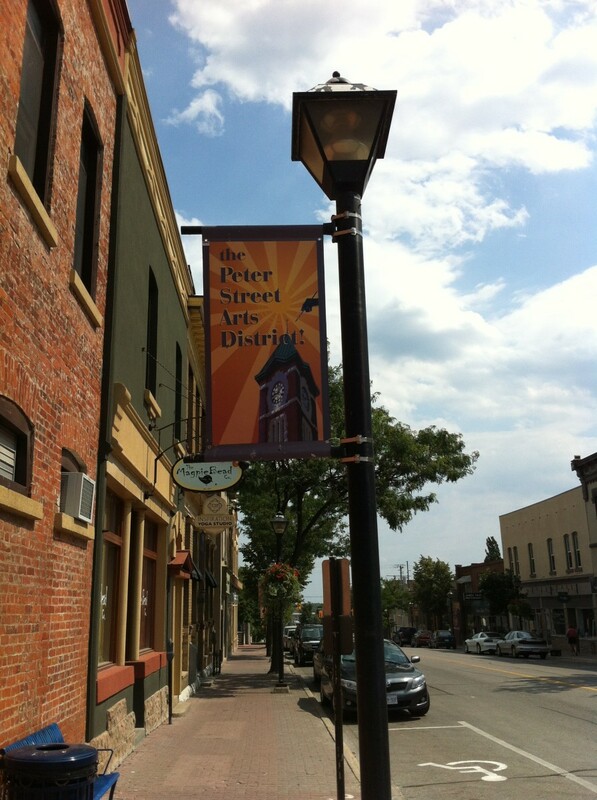 Your photos are outstanding and really show the beauty of the area. I've been to Niagara Falls several times but never knew about this beautiful place. Thanks for taking us there. Thank you very much indeed for visiting this hub and leaving encouraging comments. I have only recently become fond of water based conservation parks and will be visiting some other in the USA soon. I love hubs like this because sometimes it's about a place I haven't been or heard about. This is definitely one of those. I love the pictures including the one of the shipwreck, that caught my eye in particular. I'm fascinated with things like this and I would love to visit one day. I have friends of mine from Canada, but I still haven't been. Voting this one up and interesting! This is an easily explorable park. I think the only restriction could be taking our dog there, unless we have our own boat. I don't think water cabs and cruises allow dogs on board. I find it very interesting and am now exploring this further. I think I need to make few changes to the hub and find a hub member to let me link one page through here lol. This was a beautiful trip for you. There is defnitely something of interest to anyone that goes here. It is not a contest, but sort of co-op thing. Here is the link, and I think we need to share it as it is a great idea! I don't even know what is the contest about. Where can I find the information? 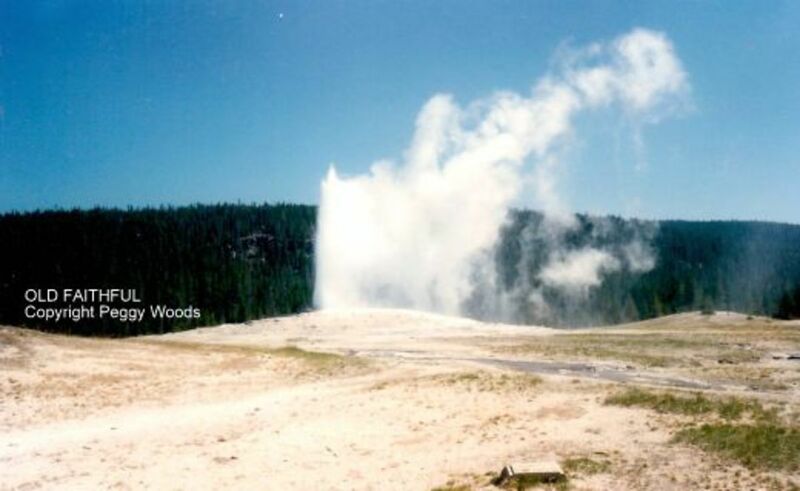 Yes it is and compared to some other similar national parks, it is easier to visit and travel through. Thanks for visiting though. Great hub. Are you putting this one in the hub challange to travel the world or a hub? You should if you are not.